Recently, I did some training during which we were asked to complete a questionnaire to figure out how we see the world. It separated people into realists, thinkers, philosophers, and doers. I had a big problem with the results, which didn’t match my self-understanding at all. After thinking it through (which it said wasn’t even my second strongest approach), I realised that the issue was that the questionnaire didn’t take into account the gut and heart brains, for which there is more and more evidence. I am a thinker, but I also honour the messages of my gut and my heart! Science shows that we have a relatively huge number of neurons in both our heart and our gut, leading to talk of our having three brains. There are still some naysayers, who argue that neurons and neural pathways are not the same as a brain, and that only our head-brain can philosophise. Which, of course, is totally missing the point! 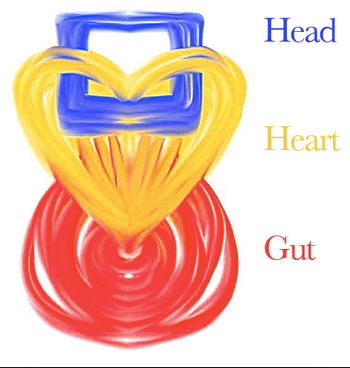 No one is claiming that the gut or the heart process things in the same way as the head. The whole point is that they do process, and that these are messages we must equally pay attention to, rather than focusing exclusively on what our head says. It is relevant to note that 90% of the communication between gut and head goes from the former to the latter. The gut sends messages to the brain for processing, rather than being simply ruled and commanded from the head. A recent study showed the effect of this communication. For instance, people who eat more fermented foods and other probiotics are less likely to suffer from depression and anxiety, typically seen as “mental” problems. Exercise, of course, is another great mood lifter, expanding the body-mind connection beyond just the gut. Listening to our “other” brains is important to live a balanced life, and to honour the messages we are getting from different areas. Coaching can be great for this, giving you tools to tune into those messages, and the time and space to explore them, and to see how to put them into practice in your life.